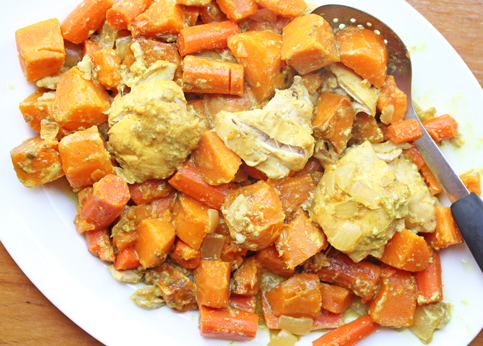 Welcome to the One Dish Dinner’s Recipe Index! Check out the One Dish Dinners on $5 Dinners too! I will be trying the southwest mac and cheese! I love mac and cheese and different variations of it! I’m looking forward to trying the loaded potato frittata! 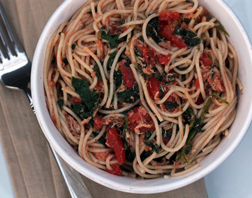 I’m going to try the chicken spinach spaghetti, I haven’t tried something like that before! I really would like to try the spicy quinoa, but don’t have the ingredients, so I think I will try the chicken spaghetti. Looks like a great website for me since I am so exhausted after supper, and want simple, healthy, gluten free, easy to clean up, dairy free meals. I will be trying out the Loaded Potato Frittata! We’re going to be trying the Southwestern Mac n Cheese next week! I can’t really go wrong with that meal. I’m sure the kids will love it! Thanks! I just bought a bag of quinoa at Costco today so I want to try the Spicy Quinoa with Kidney Beans, Corn and Lime. Looks really good! I’ll be trying the southwest mac!! Just put the Southwest mac and cheese on my menu plan! I’ll be trying the southwest mac and cheese – looks delicious! I will try the southwest mac and cheese!! I want to try the Southwest Mac and Cheese! 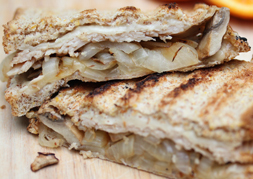 Sounds so good and I think I have all the ingredients in my pantry! 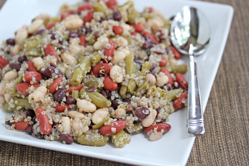 I plan to try the spicy quinoa w/kidney beans, corn and lime. I’ve got most of those ingredients on hand. Thank you! That Penne Pizza Bake looks yummy! Can not wait to get the recipe to try it out! I’m going to try the Spicy Quinoa w/beans, corn & lime. I think I’ll try & make it in my rice cooker since you can cook quinoa in it just like you cook white rice. So easy! Though I’ll probably have to add already cooked chicken from my freezer to it to satisfy my hungry and meat loving husband. the new website is great. I will be working the Spicy Quinoa into the our meal plan this weak. This is a great vegan friendly meal. Thank you for being so vegetarian and vegan friendly with your recipes. I can’t wait to try them all! And congrats on the new website! I’ll be trying the Loaded Potato Frittata, but the Penne Pizza Bake looks good too. Can’t wait for that one to be posted! 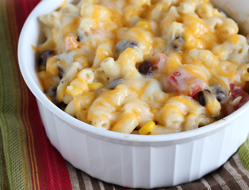 The southwest mac and cheese looks yummy and the family will love it so I will make that! I want to try the Southwest mac and cheese – looks and sounds yummy! I’m going to try the southwest mac and cheese – looks and sounds yummy! 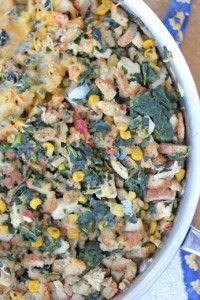 I’ll be doing the chicken spaghetti with spinach…….i love colorful dishes!! Congrats on your new site! Love your ambitious personality!! Go girl! I can’t wait to try the southwest mac n cheese. Can’t wait to try the frittata and the mac n cheese! I am going to make the skillet dinner tomorrow! Looks amazing! 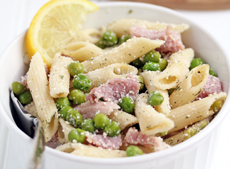 The pizza penne looks like something my hubby and kids will love, we’ll be trying that one for sure! I’ve also been looking for quinoa recipes, so I’m sure we’ll try those as well. Great new site! Chicken and Spinach Spaghetti looks great! Thanks! Looking forward to the southwest mac-n-cheese – ready for some ADULT food! 🙂 Thanks for sharing! 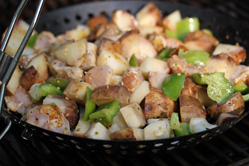 I am going to try the Loaded Potato Fritatta and the Green Pepper Chili this weekend. I will be making the Penne Pizza Bake once the recipe is posted. It looks really yummy! i will be making the southwest mac & cheese for my mac & cheese loving family. i think they will love it! We’ll be trying the spicy quinoa! I’ll be trying the Loaded Potato Frittata. I’ve used the ziploc freezer bag flat method for a long time. 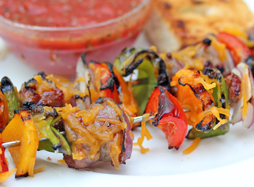 It’s great for last minute meals, or when everyone wants something different. I want to try the frittata and the southwest mac and cheese. Yum! 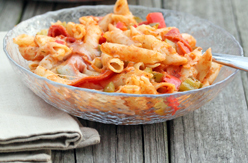 That penne pizza bake looks great & my kids will luv it! I will be trying the Soutwest Mac-n-Cheese. Homemade mac-n-cheese is my son’s favorite. I hope he likes the variation. I would like to try the southwest macaroni and cheese this week. Definitely making the loaded potato frittata. It looks and sounds amazing! So excited about the new site! I want to make the penne pizza bake! Hope the recipe is posted soon!! Both the Southwest Mac and the Chicken Spaghetti look good and I’ll be trying both next week~ Thanks!! I’d really like to try the Penne Pizza bake. I hope it gets posted soon! I will be trying the Chicken Spaghetti as well. Yum! 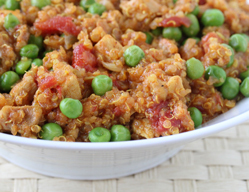 I want to try the Curried Quinoa with Chicken and Peas. It looks wonderful and quinoa is so healthy. I will be trying the southwest mac and cheese! I am going to try the penne pizza bake. Can’t wait to try the Loaded Potato Frittatta…proving my point that Gluten Free CAN be tasty! Thanks so much! 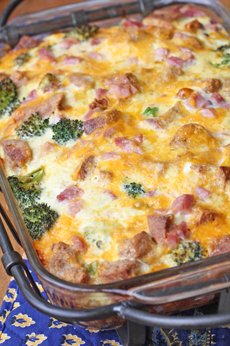 the loaded potato frittata looks wonderful and yummy. 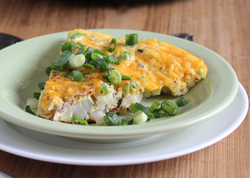 Loaded Potato Frittata looks delicious! Oh wow, the Southwest Macaroni and Cheese looks good. I will DEFINITELY be trying that one soon! One dish and $5??!! I’m in! Can’t wait to try the Southwest Mac & Cheese! I want to try the spicy quinoa! Looks delicious! Since we’re big Mac and Cheese fans, I’ll be making the Southwest Macaroni and Cheese this week. I plan to add in a can of Mexicorn instead of the plain corn. 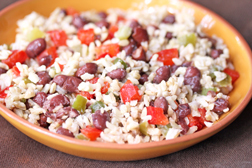 I plan on trying the Red Quinoa with corn lime and black beans. Looks delicious! 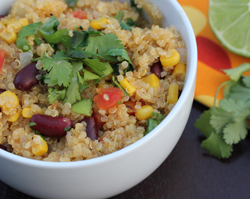 how about the Spicy Quinoa with Kidney Beans, Corn and Lime! I have an unopened box of quinoa and have yet to take the dive. I have been looking at Frittata recipes. I have never made one, but after reading your recipe, I think I will be trying this one. It looks so yummy, and very easy. Thanks so much for your great recipes and ideas! I will narrow it down to one of the quinoa dishes! Williams-Sonoma just got a great black quinoa in, and it’s lovely. I’ve been trying to use it in unusual ways, and the curried quinoa dish particularly caught my eye! I will be making the southwest mac and cheese…sounds yummy! I’m gonna try the Loaded Potato Frittata. YUM, potatoes, eggs, and cheese. I think I’ll give that yummy looking potato frittata a try and count me in as another person looking forward to the Penne Pizza Bake! I plan on making the Spicy Quinoa and Bean dish. I am such a fan of quinoa – great new site idea! Love it!! I cannot wait to try these recipes. I am always looking to simplify my recipes and get in and out of the kitchen fast, but yet taste good! I am going to try the southwest mac and cheese. I think this is something that my family will love! I want to try the chicken spaghetti with spinach. it looks great. Can’t wait to try the Chicken Spinach Spaghetti!!! I am going to try the Loaded Potato Frittata. I’d like to try the Curried Quinoa most but it looks like I’ll have to do the Chicken Spaghetti until the other recipe comes out. 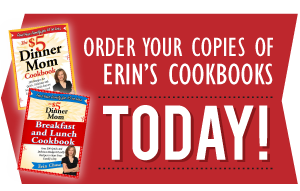 Will you cookbook include freezing information? Some of these recipes look like they would make great freezer meal options. You’d have the entire dinner right there in the freezer! I’m going to try the Southwest Mac & Cheese, that looks yummy! I’m going to try to mac & cheese. Sounds like a yummy variation! 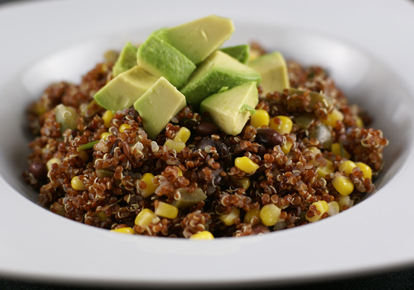 Spicy Quinoa with Kidney Beans, Corn & Lime sounds great and being that it’s both gluten-free AND vegan is wicked awesome! Gonna make it this weekend! FYI – quinoa is supposed to be well rinsed with warm water (use a fine mesh sieve!) prior to cooking it to rinse off the natural saponins. If you don’t do that it could taste bitter. 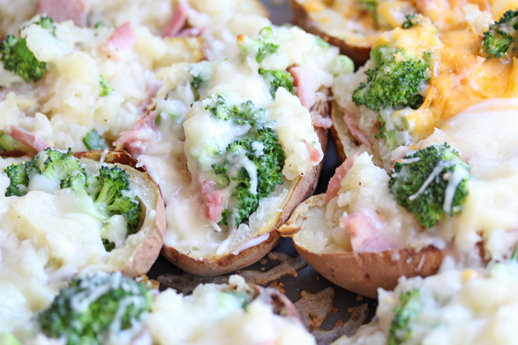 I’m going to try the Loaded Potato Frittata – looks delicious! Do you think it would taste good with sausage instead of bacon? I’m going to try the Chicken Spaghetti with Spinach. Looking forward to the Penne Pizza Bake recipe too! The Chicken Spinach Spaghetti and Southwestern Mac & Cheese look like recipes my family will like. Thank you! 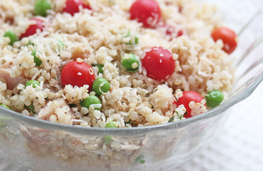 Spicy Quinoa…oh yum! Just bought some and was hoping for a recipe to use it in…hooray! I will be trying the loaded potato frittata, looks great! So going to try to Southwest Mac and Cheese! My family will love it, and my luck Rotel tomatoes are on sale this week!!! And not to mention how much I’m going to love cleaning only the one pot!! Thanks. I am looking forward to trying the Penne Pizza Bake! can’t wait to try the loaded potato frittata for supper !! I would like to try the Southwest Mac & Cheese recipe! I’ll be trying the Southwest Mac and Cheese! Looks yummy!! I am SO excited to make the Penne Pizza Bake! I really think that my son is going to love it. Love the One Dish Dinners concept. My least favorite part of the dinner-making processes is clean up, so I am all about minimizing the number of dishes used! Can’t wait to try the Chicken Spaghetti! I like the looks of Southwest Mac n Cheese. Think I’ll have to try as the husband and the toddler *might* finally eat the same dinner. I have the Southwestern Mac n Cheese on my menu. Chicken Spinach Spaghetti looks good! Going to try it next week. That Penne Pizza Bake looks divine!!! and I have no idea why my husband’s face is my avatar… but isn’t he handsome! We are going to try the Chichen spaghetti with spinach! I will be trying the Southwest Mac N Cheese! My daughter could eat MnC every day of the week and I’m always needing a way to jazz it up for the rest of us! ;) Thanks!!! I will be trying curied quiona. We love it, I love that you do some gf! Perfect meal for us to try – Chicken Spaghetti with Spinach. I switched out our Saturday night meal for this one. Looks delicious…and no oven heating up the house!!! I’m going to try that loaded potato frittata. It looks delish! I will definitely be trying the curried quinoa!!! Definitely the Southwest Mac ‘N Cheese is going on my menu for next week. My 3 year old eats so much mac & cheese it’s almost embarrassing. 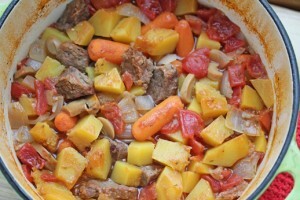 This recipe will push her comfort zone just enough and the rest of us will be glad for a little variety. I’d love to try the frittata but I don’t have a cast iron pan, or any skillet that I can use in the oven. Must put that on my wish list. I’m adding the Southwest mac ‘n cheese to our menu for the coming week. My family will love this! I plan on trying the Loaded Potato Frittata recipte this week. Always looking for new ideas for breakfast (as well as breakfast for dinner). Thanks Erin! I’m going to try the Curried Quinoa. We’ve never tried quinoa before, but love curry so this will be a great way to try something new! The “Curried Quinoa” looks like a great to try out quinoa! I’m gonna try the southwest mac and cheese tonight because my son has been asking me for “macaroni” all week long. I think I’ll be making that loaded potato frittata, because even though I used up some of the potatoes from the Seder, I still have several left over. I heart this site. And I love you! I am going to try the Southwest Mac and Cheese!! Yummy! I will try the Southwest Mac and Cheese. 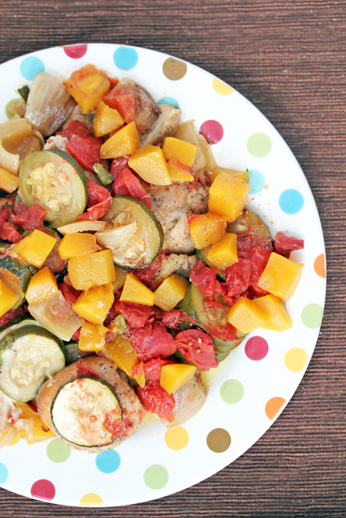 I love dinners that only have one pan for clean-up! 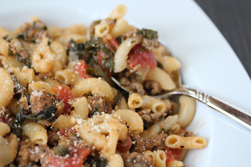 I want to make the Penne Pizza Bake–YUMMMMM!! The mac n cheese looks so good but so does the spaghetti I look forward to these new items my family will enjoy! That chicken spaghetti with spinach looks sooooooooooooooooooo yummmmmmy! I think I would be the only one to eat it in the house. But Imay just try it anyway! Will be trying the Southwest Mac & Cheese! The frittata sounds really tasty, but I don’t have a cast-iron (or other oven-proof) skillet right now. Until that is remedied, I’ll add the Southwest Mac ‘n Cheese to this week’s lineup. 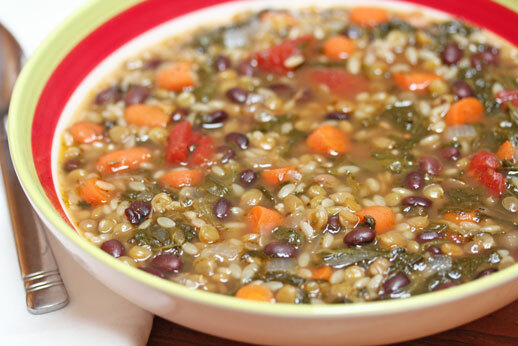 A perfect meat-free meal to serve during Holy Week! I will be trying the Loaded Potato Frittata! They all look good but I’ll probably try the Southwest Mac ‘n Cheese first. I’m looking forward to the Penne Pizza Bake. Thanks! Mac ‘n Cheese for me please! It looks delicious! While the southwest mac & cheese looks right up my alley, it would not work for our dairy free family. So curried quinoa it will be! They all look good! I think I’d try the penne pizza bake first, since I know my picky 3yr old would love it! He loves anything with red sauce. I can’t wait to see the recipe! I will be trying your Loaded Potato Frittata recipe! I will be trying the Chicken n Spinach Spaghetti. I love Chicken Spaghetti so I cant wait to try this new variation of one of my favs…. The Mango Chicken with Zucchini & Sweet Potato and Chicken Curry Slow Cooker meals have me very intrigued!! 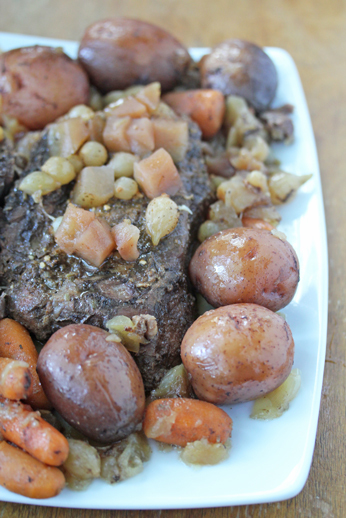 Decisions, decisions… Well, at this moment, this 9 month pregnant lady would gobble up that beef roast! 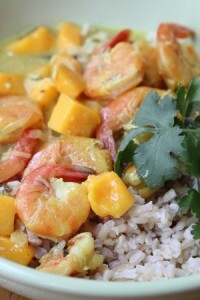 Or the shrimp mango curry. Or one right after the other!